I would like to populate the "Owner" select option list by SELECTing the owner column from the #__gscrm_accounts table WHERE the gscrm_account_id (primary key) is the selected "Person or Business" value. This ajax needs to be triggered by the onchange() event of <field name="account"> then populate <field name="owner">. To be clear, I don't know if this is "fresh" or "modified" copy of SimpleCRM because I've never used SimpleCRM and this project was just thrown at me. <field name="account" class="high28" labelclass="label_left" label_placement="top"
<field name="owner" emptylabel="1" class="high28" labelclass="label_left" label_placement="top" label="COM_GSCRM_NOTES_OWNER_LABEL"
I know that I will need to add a bit of complexity to the query that I actually require and it might not be a single "owner" value that I am returning, but my question is: How do I execute the ajax process using best practices and pre-existing classes/methods if possible? I had a look at https://docs.joomla.org/J3.x:Developing_an_MVC_Component/Adding_AJAX but that isn't specifically dealing with <field> tags. This looks close: How to change select list from another using AJAX in Joomla but I am not sure about the best placement of the files and I am not dealing with chozen elements. If so, where do I best park my getOwners() method? All of the posts have a fair bit of age on them and I expect to see a token used in this process. // Add session token script. // Optional AJAX error message. // Build a selector for the field we want to update. This example is for the filter form. In the XML form add this to the field that triggers the event. Where fieldToUpdate is the name of the field that will be updated. // Check that we're manipulating the correct form. // Run only on HTML document. // Load form token script. // Add error message string. // Add onchange attribute to the field. This component is developed using Akeeba FOF, so you need to read the documentation to know how to complete the task. Almost everything is configured using XML, this is to some extent of course. make sure to replace yourfile.js with the correct file name. If I understand what you are trying to accomplish the easy way to do this would be with a bit of jQuery and an ajax call. Add a method to one of your controller files that returns the value of the owner field. Post the id of the person/business filed to that controller using ajax.Return the id of the owner field. 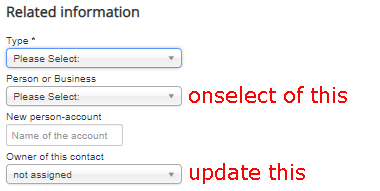 Use jQuery to set the option to the appropriate value. Not the answer you're looking for? Browse other questions tagged component ajax fields fof simplecrm or ask your own question. How to create a repeatable xml form field feature?